The strangest thing has happened: I’m suddenly into colour! 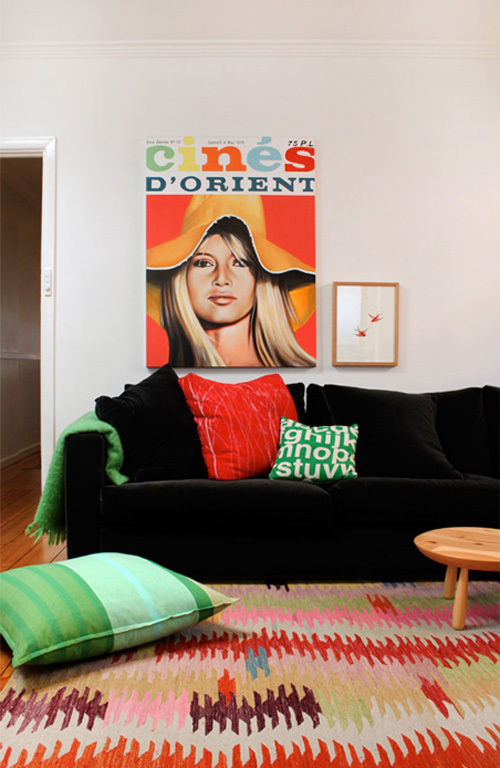 I’m loving this living room with colourful rug and Brigitte Bardot poster. Yay! I love colour 🙂 I love this colour combo too. Color is the candy of design. Once your hooked, it’s hard to quit. LOVE this interior that has caught your eye. How striking is the Brigitte Bardot poster – such an icon. Can’t get enough colour myself, so I hope you continue to enjoy! This is quite different to a lot of the interiors on this site… love the use of colour.